President Barack Obama issued a strong appeal to lawmakers of both parties in his Jan. 27 State of the Union address to continue their vital work on healthcare reform, an issue that affects all generations. The current economic crisis has challenged Americans from all walks of life. President Obama rightfully addressed plans to promote job creation and business recovery. However, we must remember that true economic recovery is not limited to the workplace. Our nation’s most vulnerable children, families and older adults – the populations hardest hit by economic losses – need care, resources and support. As we await details about President Obama’s deficit commission and plans for a spending freeze, we caution that any conversation on deficit reduction must be viewed through an intergenerational lens. We hope that the proposed deficit commission and spending freeze do not become part of short-sighted fixes detracting from the far-reaching goals President Obama has pledged to achieve for all Americans. We are pleased with President Obama’s emphasis on education and child care, recognizing that despite difficult economic times, he is emphasizing long-term investments that benefit all generations. Investing in our youth, and in education across the lifespan, has immediate payoffs as well as long-term gains. So does the announced increase in the National Family Caregiver Support Program (NFCSP), which provides critical services to support family caregivers, including grandfamilies – grandparents or other relatives raising grandchildren. We join President Obama in paying respect to the many generations who have sacrificed and worked for a brighter tomorrow. We also stress that connecting the generations is key in solving the problems facing our country. Intergenerational programs have been shown to successfully fight childhood obesity. Workforce mentoring across generations improves communication and productivity. 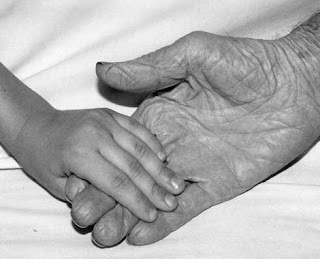 Grandfamilies provide care and support to our most vulnerable children. Our country is rich in both history and in opportunity, in wisdom and in possibility. As we move into 2010, we must recognize the interconnectedness of the generations and look to solutions that benefit and engage all ages. President Obama will announce a proposed increase in the National Family Caregiver Support Program (NFCSP) during his State of the Union address on Wednesday night, January 27, 2010. The NFCSP, part of the Older Americans Act (OAA) provides critical services to support family caregivers. Up to ten percent of the funding appropriated for the NFCSP can be used to provide support services to grandparents or relatives over age 55 who are raising relatives’ children. Visit our NFCSP resource page for more. Greetings! Here at GU, we hope your Martin Luther King Jr. Day holiday was filled with reflection, rest and service. Donna Butts was in the Washington Post on Monday with an op-ed about intergenerational service on MLK Jr. Day and the importance of grandparents and older adults in the lives of our children. Grandparents laid the foundation for both King's and Obama's successes as leaders, just as "First Grandmother" Marian Robinson does today in the White House. We're also proud to highlight the many successes this weekend by teams of intergenerational volunteers. In her op-ed, Donna referenced the great work going on in San Diego by Keep The Spirit of '45 Alive and the intergenerational volunteer project headed by United Way of Greater St. Louis. Also this weekend, President Obama marked MLK Jr. Day with an intergenerational reflection on the civil rights movement, and in Baltimore, Experience Corps members shared stories with students about their own childhoods during segregation. Dr. King said, "We are caught in an inescapable network of mutuality, tied in a single garment of destiny. Whatever affects one directly, affects all indirectly." Let's continue to view the world from that intergenerational perspective in the year ahead. In this time of heightened conversation about the national debt, Social Security and other vital government programs, we've just released a Fact Sheet illuminating the intergenerational benefits of Social Security. Social Security pays more benefits to children than any other federal program, and serves as a safety net for our most vulnerable children and families. Read, re-read and pass on to your friends and contacts -- we'd love to know what you think about this critical matter. Senators Kent Conrad (D-ND) and Judd Gregg (R-NH) have introduced a bill in Congress to establish a commission made up of a group of people (mostly from Congress) that would produce a plan to reduce the federal deficit. Congress would then have to vote on the proposal with no opportunity for amendments. Effectively the commission would have the ability to alter all federal policy with limited democratic input. Proponents of the commission frequently say the establishment of the commission is necessary for the future of children in the United States. Nothing could be further from the truth. The commission is a potentially dangerous vehicle to cut programs like Social Security and Medicaid that serve some of the most vulnerable young people in this country. Social Security, specifically targeted by Conrad-Gregg keeps 1.3 million children from falling into poverty. Additionally, six and half million children in the United States receive assistance from Social Security’s survivors benefits program. These are vulnerable children who have lost a parent and who might otherwise be at risk of slipping into poverty. Contrary to their alarmist rhetoric, Social Security is not even contributing to the federal deficit. The program is still running a surplus (yes, a surplus). In fact, according to the last Social Security trustees’ report, Social Security will continue to run a surplus until 2023 and will build its reserves to $4.3 trillion. Social Security deserves the consideration of experts that understand the program and its history and know how to strengthen it for future generations – not a 16-member commission. Happy Tuesday! We're excited to announce the 4th annual Rachel Carson "Sense of Wonder" contest with our friends at the EPA, the Liz Lerman Dance Exchange and the Rachel Carson Council, Inc.
Carson is considered to be the founder of the contemporary environmental movement through her landmark book, Silent Spring. Its publication is credited with reversing the nation's pesticide policy. The categories are poetry, photography, essays and dance. The contest seeks to instill a sense of wonder for the environment among all generations and spur environmental stewardship. Entries must be from a team of two or more persons from both younger and older generations. The deadline for team entries is June 16, 2010. The winners will be announced in October 2010. The public will have the opportunity to vote among the finalists for the winners in each category. For more information, visit the contest Web site. 2010 promises to be an exciting year at Generations United, with new research, analysis and statistics brought to the forefront. We just released our 2009 GrandFacts report, which looks at a little-known subgroup of grandfamilies -- "skipped generation grandfamilies," families where neither parent of the child is present. We also want to highlight the resource library at the GU Seniors4Kids Web site, www.seniors4kids.org -- S4K's Web site had many downloads and requests for information in 2009.